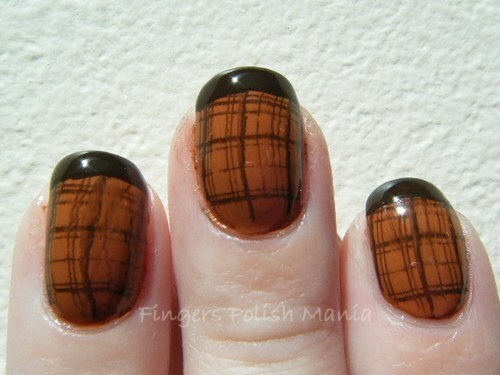 Today I am showing you yet another Nails Inc color. I do hope you guys are loving this as much as me. This one is called Fenchurch Street. It is described as a camel brown color. To me, it's a pretty orange brown. Dreamy. First I have for you the bottle shot. Taken in an artsy fartsy way. How do you like that shot huh? Nice right? Any way, once again this color really only needed one coat, but I always do two as you know. And my fast top coat did not disappoint, in it's drying time and shininess. Here are indoor and outdoor shots. Do you think that color looks like a camel? I have no idea. It's been a long time since I saw a camel at a zoo. To me, this color is sort of a caramel. I think it's lovely. I know you're probably bored with my not doing my funky frenches on these Nails Inc colors. So for you, I got out my stamper and my Essie Little Brown Dress and plate M60 and here are the results! Don't look too closely, as you will see my stamping is sort of not perfect. Plaid lines are hard to lay straight on a curved surface. I also want to apologize for this post not having my usual sarcasm and humor. I just can't come up with anything funny today. I just love these colors together. They scream fall to me. I think this is a really cool look and would definitely do this again, maybe with other colors. What do you think? This is probably not what you want to hear, but I hate this color! 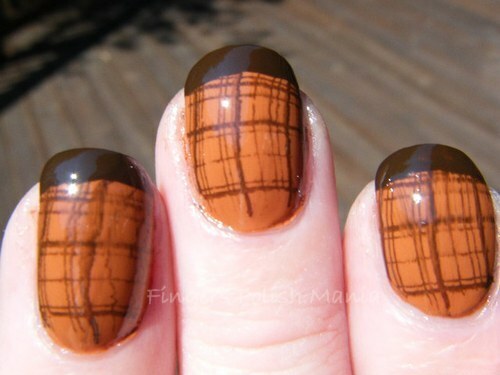 Any combination of brown/orange just reminds me of... well let's not go there because it's pretty gross, lol. Although I think it is the only color I truly don't like, so that's something. This color is definitely not for me. I can't wear colors like that, they make my skin look weird! I think it's really pretty but I just couldn't wear it! ;) Love the plaid stamp though! I will have to pick that one up! Not digging the base color...I love, love the pattern you choose... 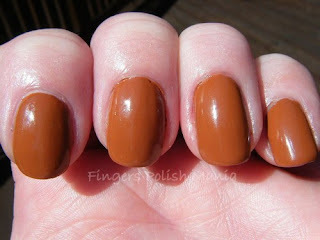 I do like the brown over the base coat though.... Your bottle shot and comment cracks me up! @Laura, Carly, Nail-venturous-I'm sad that you don't like my pretty color! Oh well-more for me then! The plaid stamp is cool isn't it? Wait til you see Thursday's! I like the plaid! Not sure how I feel about the brown....too light for me, but looks good on you! @P&C- not too many are digging this color! I like it! @Sandra- Mary Poppins? 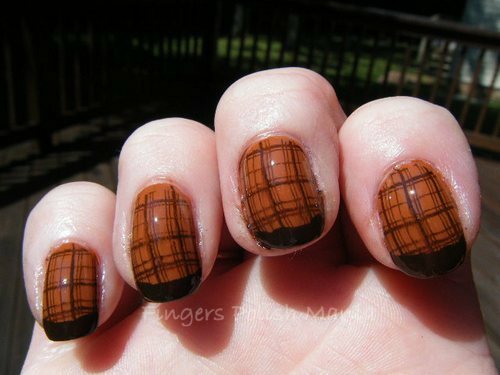 I remember some plaid- but it's not my first thought! Hahaha! I will differ from all the other ladies but I do LOVE this colour! I bought a similar one called Mustard by H&M and I think it's perfect for fall! I also love the way you print your nails leaving the French tip, so cool!